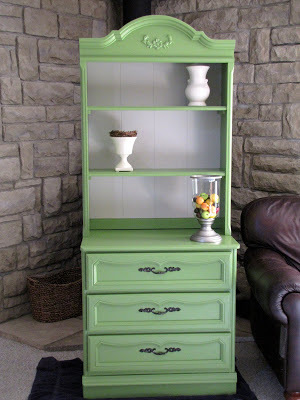 I had been looking for an inexpensive piece of furniture to use in my basement family room for a display area and extra storage. So when I saw this piece on Craigslist for only $25.00 I bought it. Hey, it’s not pretty now, but I knew I could work with it. 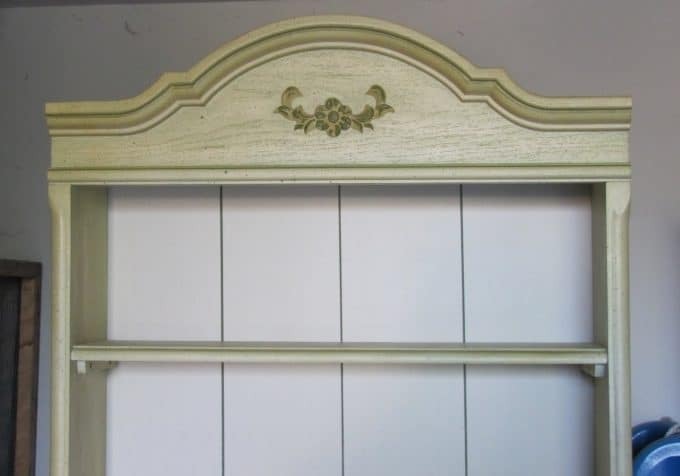 It is the typical 1980’s little girl’s bedroom hutch with 1980’s paint. 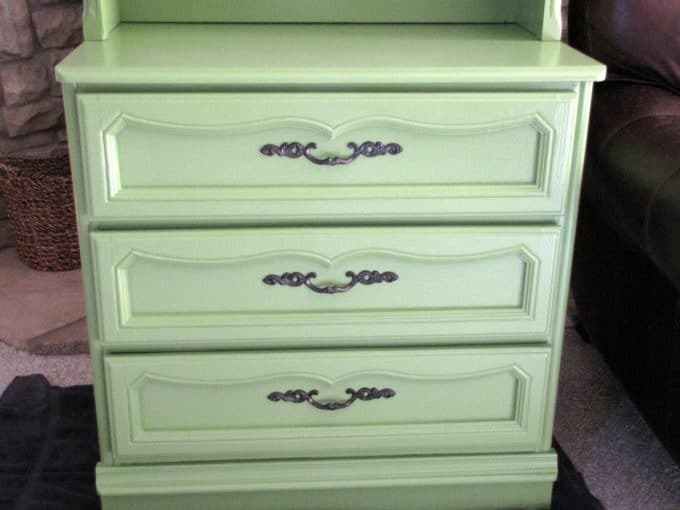 Not sure why the two bottom drawers were a slightly different color that the rest of the hutch, but for the price I wasn’t being picky. Oh, and I didn’t notice it until the drive back to my house, but the old owners were smokers. Heavy smokers. Very heavy smokers. 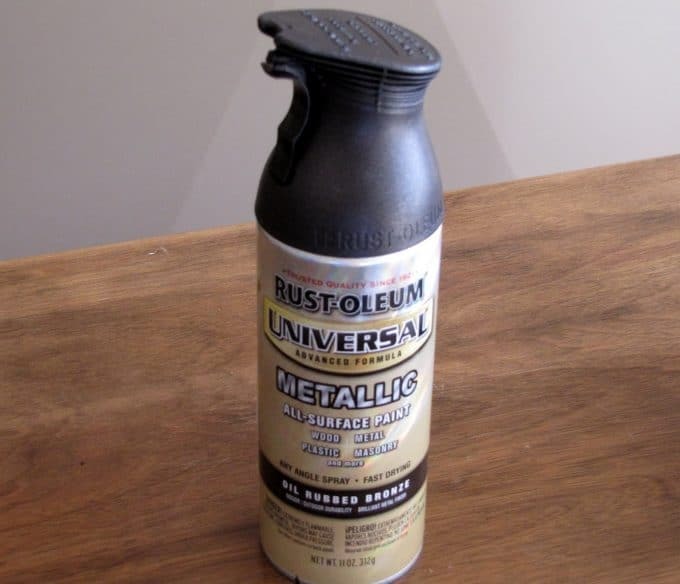 So lesson learned – sniff before you buy. It has a cute little flower embellishment at the top. I used Murphy’s Oil Soap to clean it. Then went over the entire piece with vinegar to try to eat up the smoke odor. And as a last step before painting I used Krud Kutter Pre-Paint Cleaner to clean it one more time and degloss it. I went to Home Depot with a thoughts of possible colors swirling in my mind. I could be safe and paint it off-white or black. But that would be predictable and a little boring. I really wanted to paint it a french blue, but since my family room walls are yellow and I have some red accents, the blue wasn’t going to work too well.Since I’ve been in a green phase, I decided to go that route. I looked at the Martha Stewart colors and decided on Bay Leaf (MSL105) as the main color. 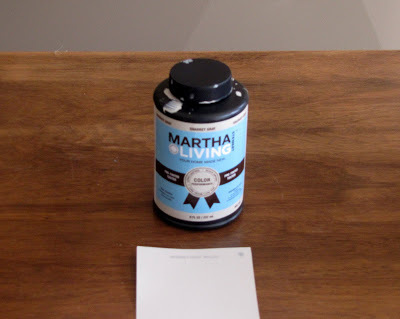 I found it interesting that when I took my color chip to the paint mixing desk, they immediately said “but, you don’t want that in the Martha paint, you would want that in the Behr paint right? 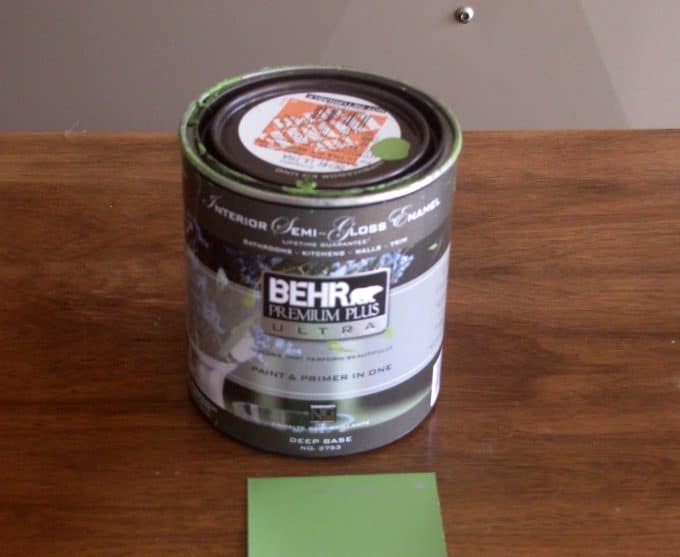 Behr is a much better paint.” Uh, I guess I’ll go with the Behr then. Does Martha know they are swaying people away from her paint products? I bought the semi-gloss Behr Premium Plus Ultra which is primer and paint all in one. I’m on the fence if the primer/paint combo was the way to go though. Now, it took me two coats to paint the piece, but there was no way in the world that only one coat would have ever covered it. Not even close. 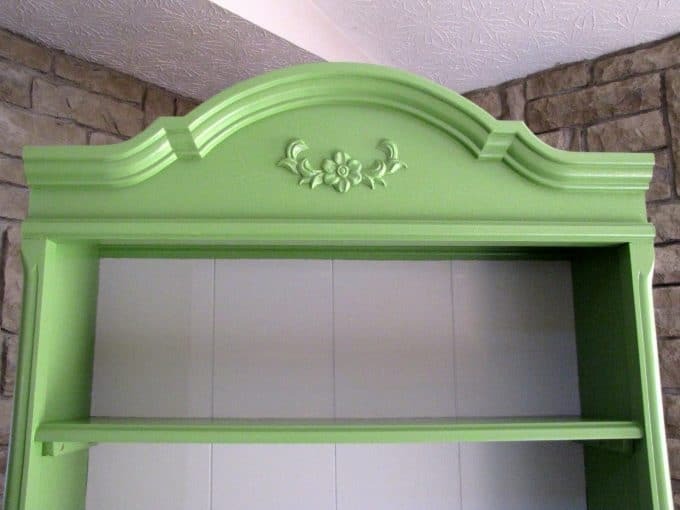 I was just thinking for the price and that fact that it had primer and paint in one that it may cover fairly well with one coat and then I would throw a second coat on to even it out. And it just wasn’t that great of coverage on the first coat. 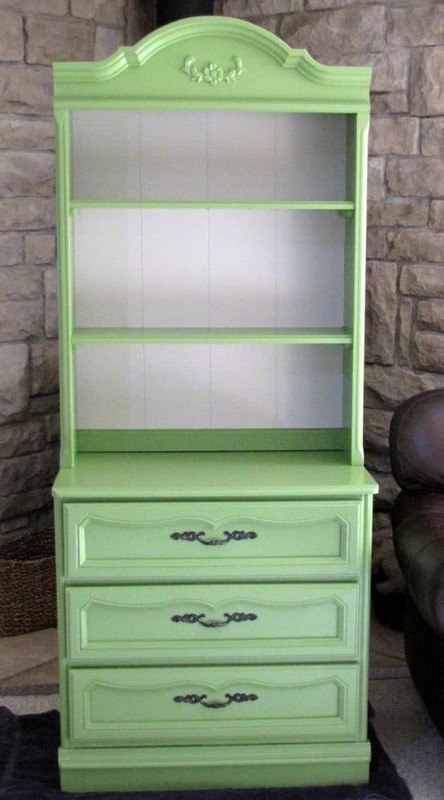 When I bought the color for the hutch area, I did go with the Martha paint because I bought one of her tester bottles from the chip display area. I went with Sharkey Gray (MSL 240) because it was the only one that was close to a cream color in the tester bottles. It was more than enough paint to do the area I wanted it for. I used Rustoleum’s Oil Rubbed Bronze to spray paint the handle pulls. I had to get rid of that nasty gold and white on those handles. I think the green really brightened it up and brought it into this century. And look at the little flower detail. It’s not as obvious as it was previously, but sometimes classy and understated is best. 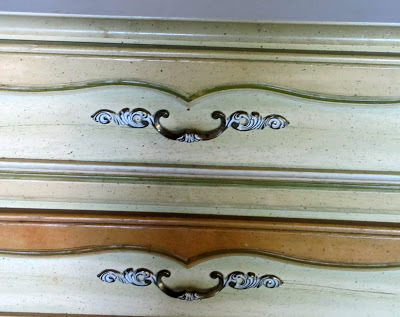 The top on these old pieces can either be used for a bookcase or display area. The bottom will be great for storage of tablecloths (once I get the smoke smell 100% out of this). And look how cute she is with some accessories added to her. Visting from Debbie’s B & A – Absolutely beautiful! I love the color. Funny, I was asked the same thing at Home Depot when I bought some Martha Stewart paint. I’ve used both MSL and Behr paint plus primer and they both seem about the same to me consistency-wise. I still like Valspar a little more. Better coverage with fewer coats. What a gorgeous transformation. 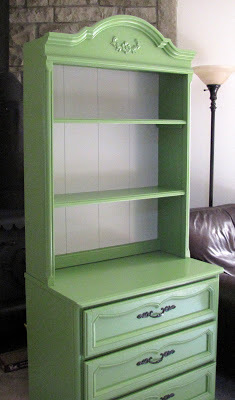 I love that color green and think it looks great on the hutch. Great job! 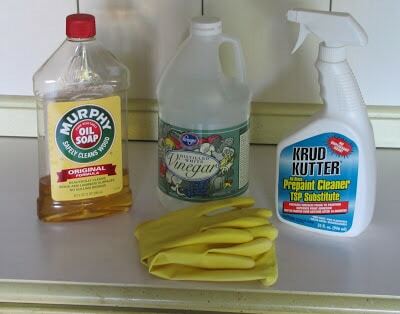 Speaking of Martha…she says to put a small dish of vinegar in the drawers until the smokey smell dissapates. It’s worth a try! It turned out lovely! Great job! 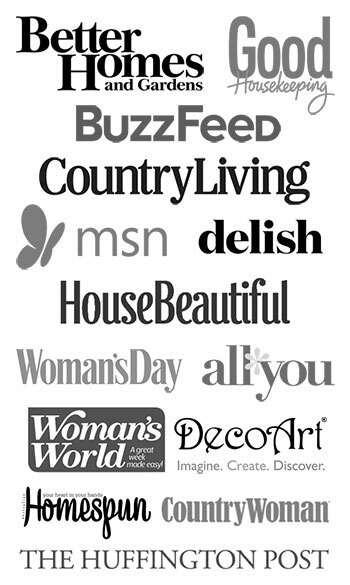 Thanks for stopping by my blog and following. You made my day! 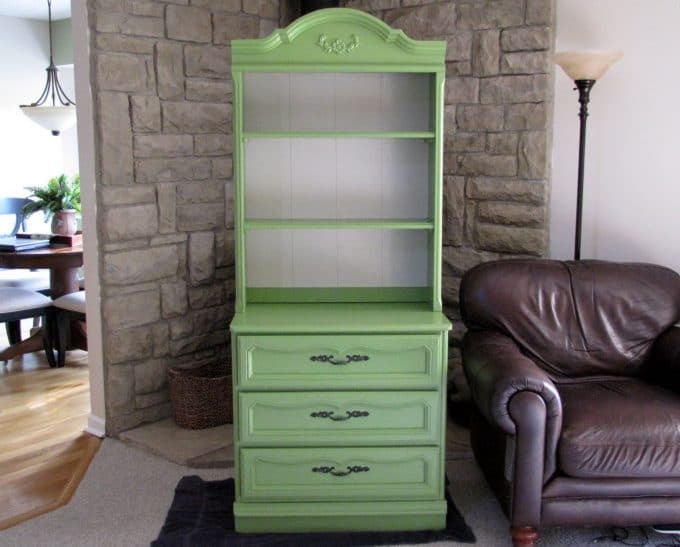 That hutch is adorable & I love that apple green. Good job! GREAT Color! I love green, its my favorite. 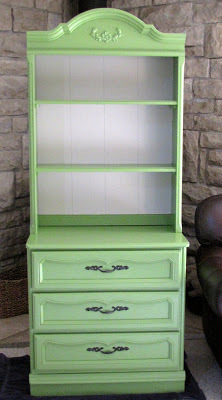 The hutch turned out fabulous! Enjoy. Thanks for the visit today as well. I LOVE this….I got a chest from a friend that smokes and I too noticed the smell once we it home…so I was wondering if the painting helped? I had read that if you put a bowl full of baking soda in each drawer it will help..it does! You did a great job, love the green. 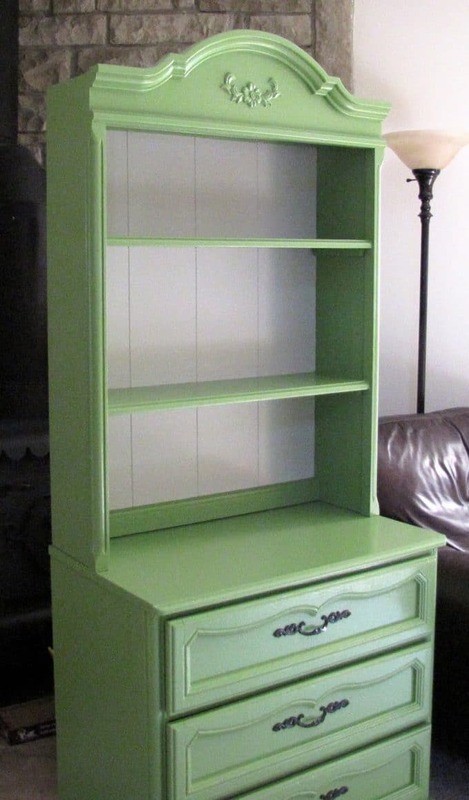 I just purchased a hutch from Craigslist. I was hoping to have it redone already but its been scorching hot here in NJ so not great for painting. I’d do it indoors but I have a new baby so for now I’ll admire your beautiful work. Thanks for commenting on my blog. I love the hutch redo. That is fabulous! I love the green! I think Martha’s paint line has some great shades. The lines of your piece are lovely too. Good find! 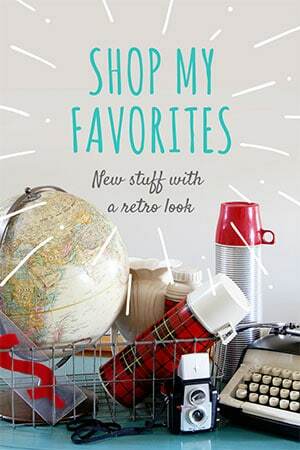 What a fabulous find! Thanks for the tips on getting rid of the smoke smell. Beautiful transformation! Wow, that’s an amazing transformation! I love it!! Stopping by from debbiedoos party! That piece has so much character! I love how it turned out and I wouldn’t have thought the green would look as good as it does. Fantastic! I njoyed my visit here very much and learned alot..
A product I love to get any smell out of anything is called Odoban. You buy it by the gallon at HD or Sam’s Club. Works great and I LOVE your green hutch! I found you thought Miss Mustard Seed. I love the green hutch. You did a beautiful job. Very nice. I found you through Tatertots and Jello. Thanks for sharing. 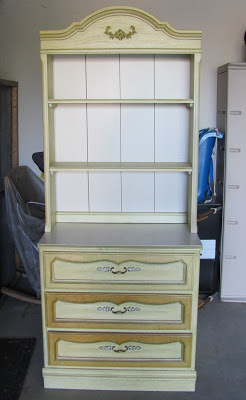 Great project…it turned out very classic and pretty!!! I love it! What a great piece but too bad it smells like smoke. Hopefully you can get the smell out of the drawers. I love the beautiful color you’ve painted it. You did a great job! I love the color you chose…it certainly brings it right up to date. It’s almost too pretty for the basement! I love that green! So pretty! Great transformation. 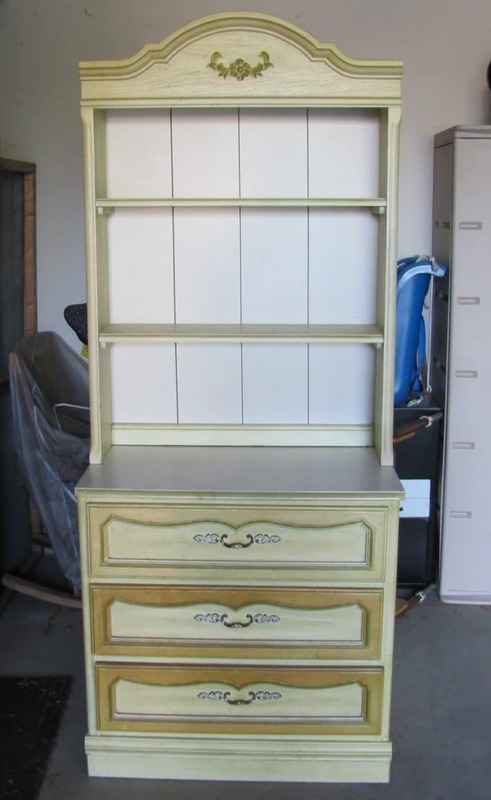 Nice job on that hutch. Funny how they talked you out of the martha’s paint. have you tried Lowes Valspar premium? I am a believer, used to be strictly a Ben Moore girl! Wow! 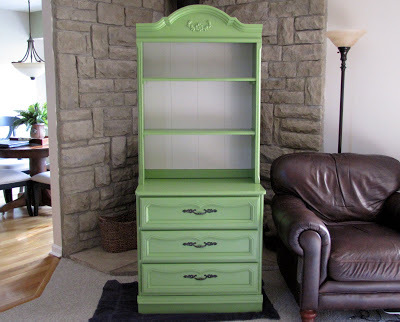 That’s a great transformation – I love the pretty green that you chose! I have tried the Behr paint with primer too and I wasn’t pleased with its coverage. I have gone back to a can of spray primer and paint. Did you find that the smell left after using vinegar. I have a dresser that smells like moth balls. I want to get rid of that smell before it makes all my clothes smell like a little old lady. Lovely turnout. You did a great job and I love the color. I am smiling since I thought I was the only one left in the world with that piece of furniture. Purchased two of them around 1982 and they were $$ then. I remember working part time to save money for them as I thought they were beautiful since they had a very light lime green to them to match the shag carpet in my daughters room. When she was a 12 I painted them white. Now her son has them and I painted them a nautical blue. 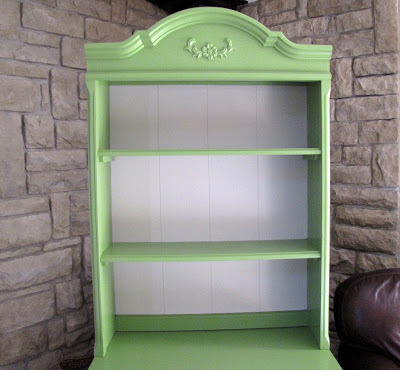 In the Fall they will be painted again and put into my daughters guest room. Not sure what color she wants me to paint them? They are almost 30 years old and going strong. Perhaps you can put some baking soda in your drawers to help eliminate the smell of smoke or a piece of charcoal works good to absorb odors (sounds crazy but it does work). Great job on this piece. Love the color. Your hard work really paid off! Very fresh and updated. Love the new look. Was there any sanding or stripping involved? I have this type of furniture from my youth and I want to revamp them for my daughters!